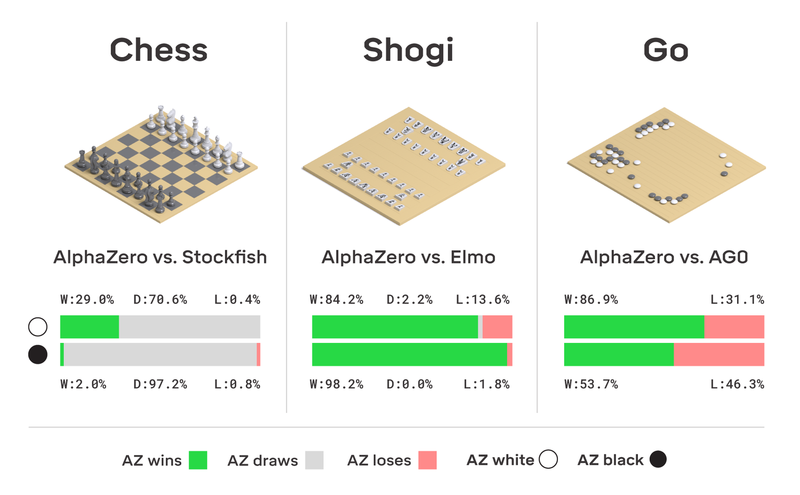 In late 2017 we introduced AlphaZero, a single system that taught itself from scratch how to master the games of chess, shogi (Japanese chess), and Go, beating a world-champion program in each case. We were excited by the preliminary results and thrilled to see the response from members of the chess community, who saw in AlphaZero’s games a ground-breaking, highly dynamic and “unconventional” style of play that differed from any chess playing engine that came before it. Today, we are delighted to introduce the full evaluation of AlphaZero, published in the journal Science (Open Access version here), that confirms and updates those preliminary results. It describes how AlphaZero quickly learns each game to become the strongest player in history for each, despite starting its training from random play, with no in-built domain knowledge but the basic rules of the game. The fully trained systems were tested against the strongest hand-crafted engines for chess (Stockfish) and shogi (Elmo), along with our previous self-taught system AlphaGo Zero, the strongest Go player known. Each program ran on the hardware for which they were designed. Stockfish and Elmo used 44 CPU cores (as in the TCEC world championship), whereas AlphaZero and AlphaGo Zero used a single machine with 4 first-generation TPUs and 44 CPU cores. A first generation TPU is roughly similar in inference speed to commodity hardware such as an NVIDIA Titan V GPU, although the architectures are not directly comparable. All matches were played using time controls of three hours per game, plus an additional 15 seconds for each move. In chess, AlphaZero defeated the 2016 TCEC (Season 9) world champion Stockfish, winning 155 games and losing just six games out of 1,000. To verify the robustness of AlphaZero, we also played a series of matches that started from common human openings. In each opening, AlphaZero defeated Stockfish. We also played a match that started from the set of opening positions used in the 2016 TCEC world championship, along with a series of additional matches against the most recent development version of Stockfish, and a variant of Stockfish that uses a strong opening book. In all matches, AlphaZero won. As with Go, we are excited about AlphaZero’s creative response to chess, which has been a grand challenge for artificial intelligence since the dawn of the computing age with early pioneers including Babbage, Turing, Shannon, and von Neumann all trying their hand at designing chess programs. But AlphaZero is about more than chess, shogi or Go. To create intelligent systems capable of solving a wide range of real-world problems we need them to be flexible and generalise to new situations. While there has been some progress towards this goal, it remains a major challenge in AI research with systems capable of mastering specific skills to a very high standard, but often failing when presented with even slightly modified tasks. AlphaZero’s ability to master three different complex games – and potentially any perfect information game – is an important step towards overcoming this problem. It demonstrates that a single algorithm can learn how to discover new knowledge in a range of settings. And, while it is still early days, AlphaZero’s creative insights coupled with the encouraging results we see in other projects such as AlphaFold, give us confidence in our mission to create general purpose learning systems that will one day help us find novel solutions to some of the most important and complex scientific problems. This article has been republished from materials provided by DeepMind. Note: material may have been edited for length and content. For further information, please contact the cited source.